November 11, 2015, 2:37 PM · Over the years one thing has been made abundantly clear to me: times I thought I was improving on the violin, I actually wasn’t. Things really started getting better when I grew self-aware, and as painful as that was, it forced me to come up with solutions independent of a teacher. The time in my life when growth occurred was not in college, but long after, and I ask myself if the early college years would have been an appropriate time to alter my same-old habits. It would have been much harder than it sounds, and in reality it didn’t happen. So it becomes a thought experiment, a back-to-the-future exercise in exploring how the musical mind works, and doesn’t work. A lot of careful thought goes into deciding when is the appropriate time to introduce concepts and techniques to young string players. The popular wisdom is that learning technique takes up much of the early years, while college is the time to develop more sophisticated musical tastes. Some teachers consider themselves specialists in one aspect or the other, yet the thin line between technique and musicality is all but obliterated by the nature of music. Each feeds the other, so by necessity; a teacher should be a specialist in both. Technique is actually harder to teach, because it’s not subjective like musicality. When teaching musicality, a teacher may admonish a student to slow down a particular way in one section, or breathe and take a break between two sections, but it’s only his opinion. On the other hand, the technique of playing in tune and sustaining a vibrating string is an essential truth and its success is not as subjective as musical matters. A teacher will have to dig deeper to help a student achieve successful technique. When Is the Right Time for a Student to Learn? The decision process of teaching the appropriate lesson at the right time is simplified when you don’t subscribe dogmatically to the order in which things should be learned. The arguments among teachers about what works when can be eliminated by the implementation of a philosophy that highlights common sense rather than extreme mannerisms. While it’s not easy to know when someone is ready to learn something. there’s never a bad time to impart good sense. For instance, if a child learning vibrato is having trouble with an even oscillation, the teacher can use this time to discuss how the pitch should be focused while vibrating. While one aspect of vibrato is taking longer for the student to work out, the teacher can teach another aspect of vibrato simultaneously. The accumulation of necessary wisdom is far better than a gimmick or a short-cut teaching tool that leaves out the details. A teacher who insists on something arbitrary and subjective, like which direction the vibrato moves, (from correct pitch to lower end, or vice-versa) is obscuring and complicating more important aspects, like good pitch and a healthy, rich sound. 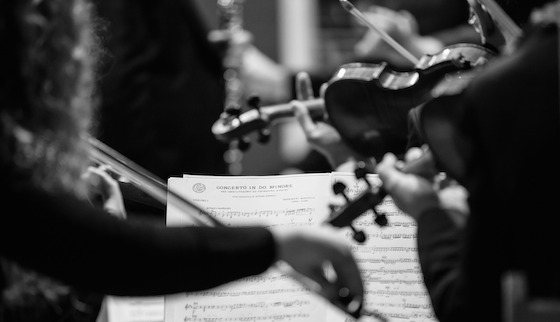 Rather than focus on a detail that highlights the minute, philosophical differences between violinists, the teacher should teach what great musicians have in common. So when is the right time to fix the stubborn weaknesses that need to be confronted? Being a freshman in college offers a golden opportunity to examine what is and isn’t working. The eighteen year-old minds certainly have developed some reasoning capabilities that would be unlikely in an eight year-old. Such thinking includes deciding if the teacher’s suggestions are viable, if he’s assigning enough repertoire, and if he’s being honest about the student’s playing. This is called “executive thinking”, and it showcases the minds ability to correlate years of experience with new strategies and suggestions. What should a string player look for in a teacher when starting college, considering that his musical mind is more discerning and his technical approach has developed a unique style? Since the student is more advanced and sophisticated after at least ten years of studying, he should seek someone who recognizes that mature and intellectual strategies need to be employed. For instance, if the player’s bowing technique produces scratching and other false tones, it’s unlikely that a brand new bowing concept will fix the problem. When I was a freshman, my teacher introduced a wavy, bouncy bow movement that was supposed to make my sound more fluid. Instead of adding beauty, it took away control. Oddly enough, this bow stroke had been given to him by his teacher. I never knew this until years later, when I saw the same bowing style that a colleague of mine had been taught. He had been taught by the same teacher as the one who had taught my college professor. A signature, unique bowing style is often used as a panacea to fix a myriad of bowing issues. The teacher merely imparts an idea that sounds good, but may not be very effective. Fixing annoying problems like faulty bow changes and bad timing between string changes takes more focused and thoughtful teaching and personal strategies. The same teacher suggested that I remove my shoulder pad at the beginning of my freshman year. The lack of stability that ensued was never regained until I started using one again. No amount of rationalization on the part of the teacher could convince me that great tone and musical fluidity would result from placing my violin with its arched back on my bony, sloping shoulders. Explaining things with poetic and deep language merely obscured the more important goals. When he then told me that the violin should not rest on the shoulder, it only made things more difficult. The explanation was mystical and poetic in nature, and certainly prevented any discussion of more important issues, like intonation and left-hand stability. Why make a difficult instrument even more difficult? If you understand how hard it is to fix old habits, you’ll realize that adding problems only makes things worse. Instead of complicating things and creating new obstacles, try to understand how things work, like the way the hair and the string engage, and how the mind processes pacing and rhythm. Some teachers who play so naturally and with so much talent have no need to verbally understand the underlying mechanics. Their gifts help them process and perform without consciously knowing what’s happening. However, they have to say something to the students. What may sound good, even unique and interesting can cause damage to the young, eager-to-learn string player. Can a young college student have the maturity to think on his own, in an environment in which a music teacher’s voice carries so much authority? There is not a lot of debate in the teacher’s studio, in the same way that a conductor or chamber music coach expects cooperation from students. Ideally, college should represent the first time that a student can think on his own. In some cases it will happen, but at the very least, the student should become aware that the teacher may be imparting lessons that may eventually prove untrue and unhelpful. This is the first and most important step for the musician to become a mature player and interpreter. Music is such a deep and complex well of beautiful details that it doesn’t matter when the student becomes his own master. Whether he is 18 or 38, he will enter a world where the beauty of music sits side-by-side with the mind’s discovery about how it all works. November 12, 2015 at 09:25 AM · Very thoughtful. Thank you.